Mosaic tiles are still very much the popular option when renovating, designing or creating your own stylish space. Using the natural stones, sparkling colours and brushed effects allow you to refine a room, whether you’re tiling a kitchen, bathroom or living space. Tiles work magic and mosaic tiles work wonders. The hottest trends right now include the modern classic and Sleek & Chic, both can incorporate metallic mosaic tiles. Did you know that glossy and streamlined designs within the home can help to achieve a sophisticated look? In fact, there are lots of unique ways to use mosaic tiles and modern tiles in general because of their ability to be diverse. Looking to transform your bathroom wall into a luxurious eye-piece? 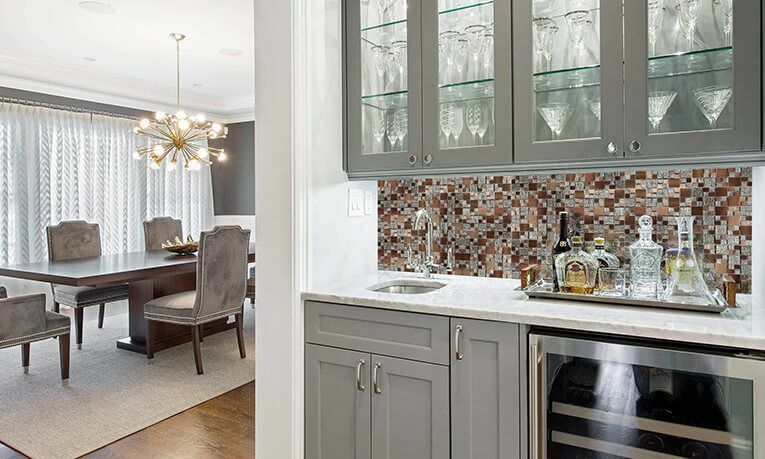 Our hand-made clear glass and brushed metal pieces combine to create perfect metallic mosaics. A blend of silver brushed metal and glass helps to resonate warmth with gleaming sparkle. If a bright and clean feel is your style – you will more than likely love this range! The kitchen is often said to be the hub of the home so why not compliment your beautiful space with our new seasonal lunar copper metal and glass modular mosaic tiles? Old is new as the vintage copper trend takes off – especially apparent in kitchens, bars and coffee shops. The metallic materials provide a welcome escape from the cold steel designs that have been popular for too long. Whilst we still love modern and dark coloured environments, like these kitchens, sometimes it is refreshing to play-around. Explore the latest mosaic tiles. If you’re thinking of re-designing any rooms in your home, you can always order up to two cut samples from us with no charge at all. We also offer style guides and advice, so if you need ideas then why not have a browse of what our in-house professionals are speaking about?